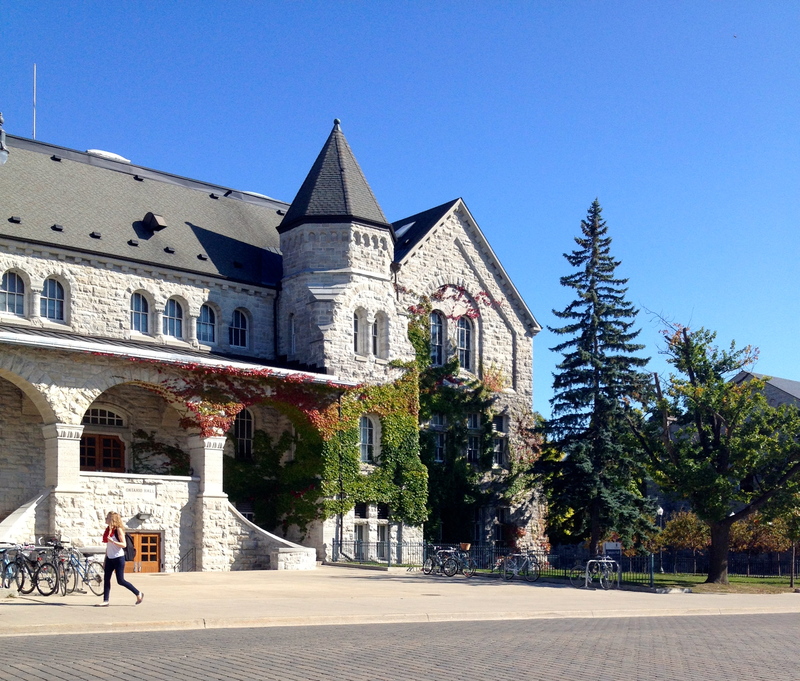 Another month down and it definitely feels like November here in Kingston. After a beautifully mild October with a stunning display of fall colours on campus, the temperature has significantly dropped. Although the crisp, wintery weather has its own charms, I was definitely slightly perturbed when my weather app reported a twenty-degree temperature difference between here and my home postcode in London. I’ve yet to buy a winter coat or boots so have been improvising by wrapping myself in a scarf that I’m worried was originally intended as a blanket and wearing as many pairs of socks as possible. Rumours are circulating that we could get our first snowfall in the next few days, however, so I should probably overcome my denial and figure out a more long-term solution. Rewinding back a bit, the second Monday in October was Canadian Thanksgiving. Celebrated earlier than its American counterpart, the holiday granted us a welcome long weekend break in the middle of the semester, causing a mass exodus from campus as the majority of Canadian students returned home. My housemate Shannon had kindly invited me to join her family for the weekend and after a relatively painless 6-hour coach journey, I arrived in her hometown; funnily enough, also London. Although Shannon was keen to subdue any excessive expectations by referring to Ontario’s version as ‘the less cool London’, it was the perfect escape from the Kingston bubble. We spent the weekend indulging in some retail therapy (something Kingston is pretty short on), adventuring around a local corn maze with a few dozen five-year-olds, celebrating Shannon and her sister’s birthdays a few days early and, most importantly, eating. My only previous experience of Thanksgiving was a turkey-alternative meal cooked last year in Edinburgh by my vegetarian Californian housemate, which, although SPECTACULAR (I know you’ll be reading this Lou! ), was on a slightly smaller scale than the feast prepared by Shannon’s mum. Frankly Thanksgiving seems to me like an excuse for a Christmas dinner warm-up, complete with all the traditional UK trimmings plus more, and of course pumpkin pie. I’m only slightly distraught that I’ve been forced to spend my first twenty years on earth without this delicious invention. Making a mental note now to stash some canned pumpkin in my suitcase so I can attempt my own version next year. Following a Timbit-fuelled journey back to Kingston, the next weekend at Queen’s was homecoming. Something I’d heard a lot about, this is another important Queen’s tradition, where alumni of the university return to campus and relive their glory days alongside current students through a weekend of day-drinking and tricolour outfits. Boycotting the big football game, after witnessing students camping out the night before to secure a ticket, we made a brief appearance at the rugby game, before fitting in a quick tactical nap and then checking out the ReUnion street festival held on campus. It’s almost impossible to imagine something on this scale occurring at Edinburgh, but we are definitely missing out – Queen’s unbelievable school spirit once again generated a great atmosphere and alongside all our fun, it was equally heart-warming to watch elderly graduates proudly wearing Queen’s jackets and reuniting with former housemates from decades earlier. Finally, the end of October obviously meant Halloween, or Hallo-weekend as it would probably be more accurately described here. A disappointingly growing workload meant I opted to celebrate just once, on the night itself, but even this was a much bigger event than expected. Although Halloween definitely features on the typical UK student calendar as a good excuse for a night out, the whole thing here seems to require much more effort. Costumes typically veer away from the last-minute blood-smeared get-up seen at home and involve much more forward planning and creativity. Low on ideas, I resisted my usual go-to choice of a cat (classic), and decided to embrace my new honorary nationality by dressing up as a Canadian. A relatively simple outfit of an ‘I am Canadian’ T-shirt (thanks Walmart) and checked flannel shirt was complemented by a plastic moose poking out of my shirt pocket and a Tim Horton’s cup as my chosen drinks vessel for the night. I even made a few feeble attempts at my version of a Canadian accent, which is definitely improving – although that isn’t saying much. The evening ended perfectly with my first taste of poutine, a Canadian post-night-out staple consisting of fries, gravy and cheese curds (I know, I’m not sure why it took me so long either), which couldn’t have been more fitting. Now, as we hurtle through the last few weeks of the semester, I’m reminded that I do actually have a degree to be studying for and a year abroad isn’t all fun and games. This month may have demonstrated the superiority of some of Canada’s quirks, but midterm season is definitely something I can live without. Great reading Harriet, keep up the good relations and have fun.